A fisherman who died after being pulled from the water off the Aberdeenshire coast has been named. A major search was launched outside Macduff harbour after the creel fisherman - named locally as Tony Masson - was reported missing from the vessel Sea Mist on Wednesday afternoon. 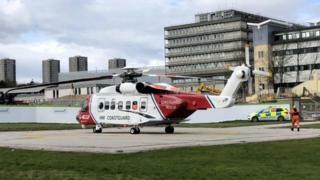 The 67-year-old died after being airlifted to hospital in Aberdeen. The Marine Accident Investigation Branch (MAIB) has started an investigation. The Coastguard helicopter found the missing fisherman in the water just before 13:30. The Maritime and Coastguard Agency (MCA) said the "large scale" search and rescue operation was launched following a 999 call from a fellow fisherman. The Coastguard helicopter from Inverness, Macduff and Buckie RNLI lifeboats and the Banff Coastguard Rescue Team took part in the search, along with local vessels.